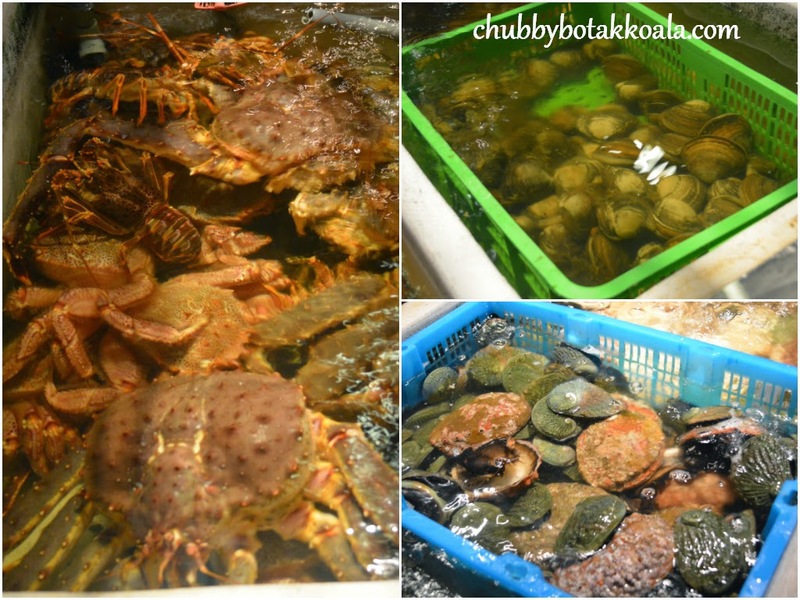 Addiction Aquatic Development ('Addiction') is a “die die must try” place to fulfill your seafood cravings in Taipei. Developed by MITSUI Food & Beverage Enterprise Group, one of the major player in Taiwan F&B dining scene, Addiction represent the group intention to bring the vitality back to the Taipei's Fish Market. There are 10 different themes in Addiction starting from: Live Aquamarine, Instantly Consume Delicacy, Seafood Bar, Hot Pot, Barbeque, Supermarket, Cooked Food, Lifestyle, Fruits & Flowers. Lets just say you will need more than a few days to sample the superb products on offer here. This time around, we visited the Barbeque section ('BBQ'). Getting to Addiction is not a problem. We just tell the taxi driver and they knew about the location instantly. It seems it is one of the hippest place in Taipei at the moment. As they are located in the centre of Taipei Fish Market, don't be surprised when they drive through warehouses by thinking that the driver trying to con or kidnap you. My first experience here was jaw dropping. Like a little boy entering a Willy Wonka Chocolate Factory, everything seems so enticing and delicious. However, we decided to curb our enthusiasm and proceed directly to BBQ area to get a table. Please note that they do not take reservation. Once you are allocated a table, a service staff will guide you through the ordering process. You can choose from live Alaskan King Crabs, huge clams, Ribeye steak, lamb chops, mushrooms, fish, poultry and even bbq rice balls (Onigiri). They will put a hot stone bbq on your table where they will serve you food on so it can remain warm. For a cold night with an outdoor dining area, such as during our visit, a bowl of soup to warm up your stomach to increase our appetite is definitely a must. The miso fish soup is just the right dish to start our dinner, with the aroma of seaweed and fresh salmon fish bones, you simply cannot resist having at least 2 bowls. Next will be the Alaskan King Crabs Legs. If you are in a bigger group, you should order the whole crab, it is more worth it. They even drain the water first before they weigh the crabs. For smaller group, you just pay per leg your order. Grilled to perfection, it is meat is smooth, fresh and juicy. The same can be said with the jumbo prawns. The clams we ordered are cooked on the shell, where the juice just ooze out. Drinking the natural juice from the meat of the shell is simply heaven. No seasoning was added, the freshness of the seafood tells it all. The ribeye is from a good cut with a nice marbling. It is tender, simply seasoned with salt and pepper and just melts in your mouth. The same can be said about the lamb chop, which incorporated a stronger seasoning compare to the beef. Superb!! If you are on a budget, you can order the beef and chicken on stick, which was as good. Rib Eye and Beef & Chicken "Satay"
Although the hot stone is good to maintain the warmness of your food, you need to watch out on how long you put your food there. For those heat sensitive food such as seafood, as such scallops, it is best to eat first. Our salmon was grilled nicely at the beginning, however leaving it too long on the hot stone allowing it to continue cooking, will cause some part of the fish becoming tough afterwards. Scallops, Prawn, Beef & Pork "Satay"
To finish off your meal, order their Onigiri. This rice ball is a good carbo option and a perfect ending to your meal. Wrapped with seaweed, you will have a charred taste on the outer part and the beautiful rice ball in the inside. For the BBQ section, you will be seated in a semi outdoor. No air conditioner, but you will have a glass roof top to cover you from the rain or probably taifun. The grill station is located on one side of the BBQ section, and you can see the grill masters in action through the glasses. Service if very good and efficient. The food come at a good speed and you don't have to wait too long. My recommendation is order just enough at first, then add some more along the way. Please note they only accept CASH, no plastics. Overall, we have a very good experience here. The quality of the food is very good and the price is very reasonable. We spend about NT$9500 for 7 person, which come to about S$60 per person. Addiction is really addictive. Cheers!! !